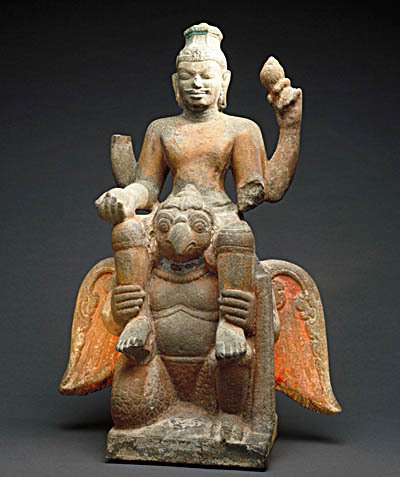 This extremely well preserved work represents the god Vishnu astride his traditional mount,Garuda. The four-armed deity is holding his usual attributes, only two of which -the conch and the discus- survive today. The head is crowned with an octagonal mitre and a thick moustache lines the face. The earlobes are pierced, which allowed precious ornamentation to be added. The pronounced ethnic facial features are typical of Cham works. Wearing a short sampot, the god is mounted on a grotesque creature: the mythical Garuda with a human body and the head of a bird of prey. One knee on the ground, this hybrid being is clasping its master’s legs in its hands. The massive canon and rounded forms of this statue are reminiscent of sculptures from Northern Indian provincial workshops. The piece displays traces of later polychromy -a reminder that many such images were formerly painted- and most likely comes from the Marble Mountains, in the Ngu Hanh So’n district in Da Lang province. Champa styles bear the names of specific sites or edifices, notably My So’n, the most representative. This work can be categorized as a prolongation of the E1 style (c. 650-730), the oldest recorded at My So’n, the holy city of the Champa.